The fully renovated, 5-star Pullman Kinshasa Grand Hôtel is in the Gombe municipality, which is the administrative and diplomatic center of the city of Kinshasa. You'll love its bright and modern design, the vibrant atmosphere of its bars, and sophisticat ed cuisine of its gourmet restaurant. For a weekend or your meetings and conventions, the hotel offers more than 16,146 sq. ft. (1500 m²) of modular space with quick access to the N'Djili international airport and spectacular views over the Congo River. 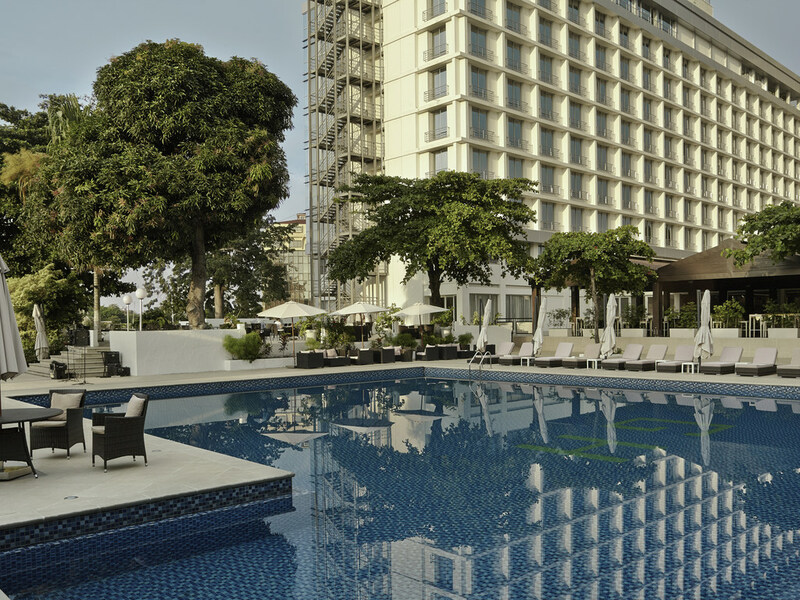 The Pullman Kinshasa Grand Hotel is located in the center of the largest French-speaking city in the world. Enjoy dinner on the Congo River, or stroll through the many local markets to take in the rich Congolese culture. The luxurious comfort of 190 rooms and suites. A vast relaxation area: swimming pool, fitness center, hammam, sauna and treatment center. Various food and drink options: 2 restaurants, 3 bars. Enjoy luxurious comfort and modern facilities in our 190 rooms and suites. Our rooms offer exceptional views over the Congo River and the city of Kinshasa. The Bomengo bar is near the reception. Enjoy a drink in this low-key, elegant environment, whether for business meetings or a spot of relaxation. The bar offers a wide selection of "Mariage Frères" teas. Open every day from 8am to 10pm. Our stylish lounge bar offers an unrestricted, 180° view of the Congo River and the city of Kinshasa from the 9th floor of the hotel. Sample our cocktails and tapas in a musical, inviting atmosphere, whether it's the weekend or just the end of a long day.